Use a cookie sheet or a baking pan, place the foil tent over it. Rub 1/2 of the sauce over the ribs--both sides. Place the rack on the foil tent, and seal the top of the tent folding it the same way you sealed the bottom. Place it in the oven and allow it to steam for 90 minutes. Now forgetaboutit! 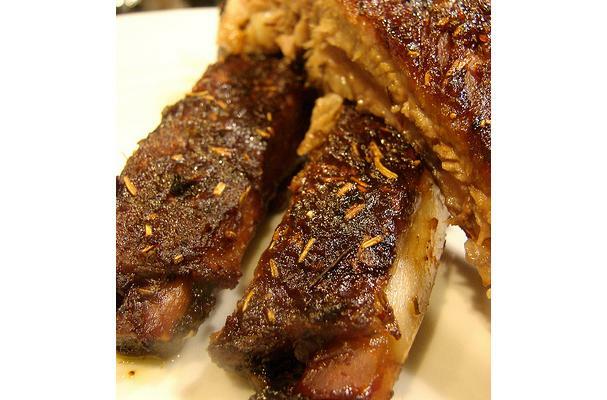 The Honey Chipotle Pork Ribs were so Easy to make & my guests could not stop talking about how good they were during the entire dining experience. They all agreed they were the BEST they ever had! It's been so cold outside, heating up the grill has been out of the question. That doesn't mean I don't still want my ribs! So, I made them indoors and OH.MY.GAWD they were delicious. I followed my Dad's method and tweaked his sauce to add a Mexican twist. See below for finger-lickin-goodness.